Boneyard #10 is up at Self-Designed Student in all its crunchy goodness. I'd particularly like to draw your attention to SV-POW! 's series on Xenoposeidon - start here and keep going! 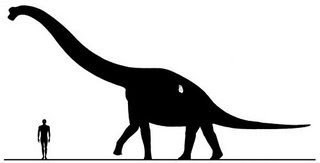 The picture at the top of this post is a rather tongue-in-cheek reconstruction of Xenoposeidon that the authors made based on an illustration of Brachiosaurus by Matt Wedel. Sadly, some of news agencies and such out there apparently failed to notice that it was obviously a joke and used it to illustrate their stories. I rather agree with one of the commentors on Darren Naish's Tetrapod Zoology post on the subject that they should have put big f***-off bat wings on its back.